With the weather forecast looking incredible on the planned departure, expedition leaders Tristan and Annie decided to move up their private flight service to 9am, to maximize water time on their arrival to Andros. Guests were met and greeted just before 8am, and excitedly discussed the plans for the day whilst breaking the ice with informal introductions and nosing through the ecofriendly goodie bags. What goodie bags, you ask? Ones that included a reusable, sustainable bamboo-covered flask from Made by Fressko, a reusable stainless steel straw with pouch from Splat Mats, a bamboo toothbrush from Mable, coral-safe sunscreen from Stream2Sea, a bracelet supporting plastic clean-ups from 4Ocean, bamboo cutlery from U-Konserve an awareness pin from Cape Clasp, custom made reusable bags from JD Vinylz, packaging-free hair shampoos from Basin, and of course, a limited edition t-shirt from us! After checking out our goodies, we boarded our nine-seater Tropic Ocean Airways chartered plane, ready for takeoff and as we approached Andros, we were even given a custom, low-flying tour down the west coast, which was full of vast, unexplored habitat scattered with blue holes! On landing we entered the tiny airport filled with smiling, friendly customs officers, and local taxi drivers waiting to take us south to our lodge. 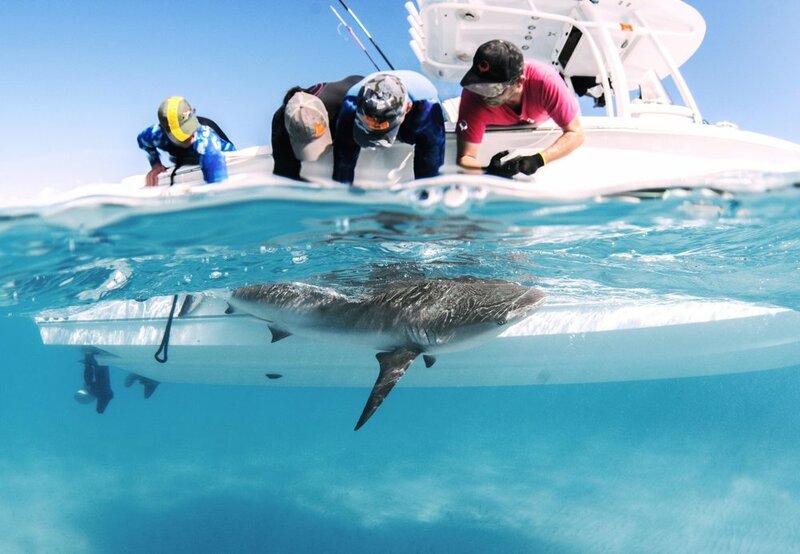 We strongly believe in giving back to the community and so local taxis, hotels, food, drink and boats are used as we bring ecotourism and a positive voice for sharks into the Bahamas. On arrival to our lodge, the Andros Island Bonefish Club, we quickly offloaded our luggage, grabbed our dive gear and a sandwich and listened whilst Tristan gave a safety briefing and trip run-down; we were on the water heading for the tongue of the ocean within the hour! The tongue of the ocean is a deep oceanic trench that reaches eerie depths of over 2000 meters and soon after our arrival we were greeted by a large male silky shark. Silkies are known for their rather fearless and bold character, however this lone male was shy and hesitant. He kept his distance but gave us all a thrill as we looked down in to the apparently bottomless, blue ocean. Some of the guests were advanced freedivers, so they took the opportunity to practice some safety protocols in the deep blue whilst others enjoyed their new surroundings and the shark circling below. By 5pm we headed back to the lodge to unpack and refuel on delicious, locally-sourced and prepared food. After dinner, guests were treated to a lecture from Tristan on the sharks of the Bahamas, where we explored the animals we hoped to encounter over the week ahead. Full up and educated a little more, we were all still eager to explore so we finished the night by getting to know the local lemon sharks that seem to enjoy patrolling the sea wall right by our lodge bar. A few beers and an incredible sunset to finish a wonderful start to the trip! The next morning, we were all up, bright-eyed and bushy-tailed for a 7.30am breakfast. Each day guests have the choice of a freshly made breakfast eggs (scrambled, fried, or an omelet) to-order at no extra cost, cereals, toast, fresh fruit, yogurt, and more. On filling our tummies and gathering an army of equipment, we left the dock before 9am. 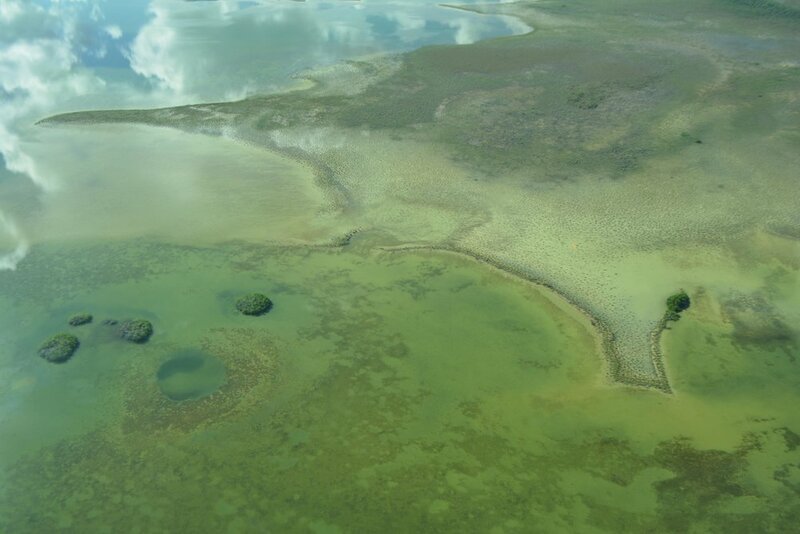 Our first drop was a beautiful coral reef which was thriving with life and pristine corals. This location had some large fish, such as barracuda swimming through, but no big sharks visible. We were all dreaming of a sawfish swim by but it just didn’t happen. These critically endangered rays are so rare we were always realistic with our hopes, however, sawfish are seen in Andros so we all prayed for a small miracle! Onto spot two and our guests were in for some lemon shark eye candy! In less than 2-3ft of water we had seven lemon sharks swimming around our feet. 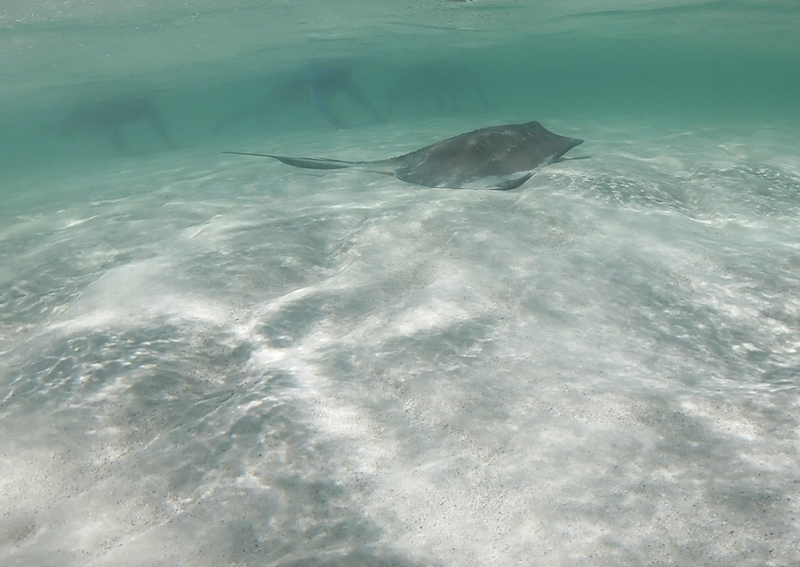 A beautiful southern stingray also swam by and gave us quite the show, unfazed by our presence as it continued to search the sand for treats. After a few hours of relaxed fun followed by an informal boat/beach lunch, we headed back to the lodge for our last excursion of the day, an inland blue hole, famously visited by explorer Jacques Cousteau. We hiked off the beaten track, following our boat captain Cole. Thanks to his knowledge of the island, we avoided some rather hazardous trees on the path to find a beautiful, brackish water blue hole surrounded by mangroves. The rather spooky blue hole appeared more of a green color, we found a few caves and overhangs and surprisingly an array of sea life! With a maximum depth of just twenty-five feet, we all had fun diving and posing in the creepy green water! Strangely, the first seven feet offered almost zero visibility, but below that, the water was crystal clear! Once our exploration fun came to an end we hopped out, trekked back to our cars and were treated to a late afternoon visit to a local conch shack. Guests witnessed local Bahamian shack owner Boston clean and prepare a conch salad from scratch. There was plenty to share as we delved in. After we tamed our hungry bellies we headed home for a quick shower and enjoyed some freshly prepared appetizers before digging in to homemade curry and rice, followed by homemade chocolate cake. Next up, a photo session with Annie was on the cards. Annie spoke about some of her most popular images and told stories of how she captured the moments, with little snippets of information on the animal in focus. After some visual treats we all relaxed on the couch, reviewing pictures from the day, charging cameras for tomorrow, and chit-chatting before slowing heading to bed for the night. We were off to an early start on our third day, with breakfast at 6.30am, to ensure we left the dock by 8am to head to the expansive west side of Andros. A somewhat bumpy ride south was balanced out by the calm waters of our pass to the west. On arrival we spent an hour searching the channels squealing at every turtle taking a breath of air, or a tarpon rolling at the surface. After an hour or so of searching we stopped off at Tristan’s Spa. Tristan’s Spa is a natural mud bank where guests were able to cover themselves in the natural mud found on the west side of Andros. Some enjoyed a facial, others enjoyed the rather odd texture, and some just teased their inner child and relished the opportunity for a mud ball fight! After our playtime we flew a drone to search from the sky, and had a curious lemon shark come in just before a rainstorm forced us to move on. So we packed up and ventured deep in a channel where we hoped to find some blacktips. Within ten minutes we had a number of blacktips approach, curious about our presence, and within thirty minutes, we had five blacktips, a large large lemon, and a couple of sharpnose sharks investigating our bait. Observing these social sharks from the surface allowed guests to really watch how these animals interact with each other, how they follow a scent, and importantly, how they play off each other’s movements and body language. It’s truly fascinating to watch the dynamics from a boat as you can fully focus on their behavior and discuss what’s happening within the group. After our blacktip success and a bite for lunch, we started our slow ride back to the east. During the ride, and to our total delight, guest Carlos spotted a large bottlenose dolphin in less than eight feet of water! A few guests immediately grabbed their gear and jumped in and were rewarded with some close passes, whilst others enjoyed the view from the boat. With divers in the water and hilarious boat commentary up top (“Ethan RIGHT in front, put your head DOWN in the water! !”), the dolphin was a big hit! So, after all the dolphin excitement we continued our journey home and stopped by a locally owned island where we were greeted by a friendly iguana before cooling off in the shallows. Rumor has it there have been some huge hammerheads seen right off the beach, so we were throwing out all kinds of positivity to get a drive-by! After a moments peace, and everybody teasing Annie for her fear of crabs, we walked back to the boat to find a few lemon and nurse sharks waiting for us, before our final ride back to the lodge. Guests enjoy cooling off after a busy day! A quick shower, and dinner was served. Each evening we had a soup or salad to start with Andros’s famous Jonny bread, followed by a main meal, and dessert with water. The lodge has an open bar/honesty policy so any sodas or beer purchased can be tallied up and paid for at the end of your stay. With our tummies satisfied we all sat down for a lecture from Tristan before relaxing by the dock with our local lemon sharks- we named one Eclipse due to its incredibly dark skin. Another day complete, we headed to bed for another early night to dream of what tomorrow would hold. Wakey-wakey, up for a 7.30am breakfast with a big happy birthday cheer to our guest Carlos! With a birthday on the boat we just knew today was going to be a good one. 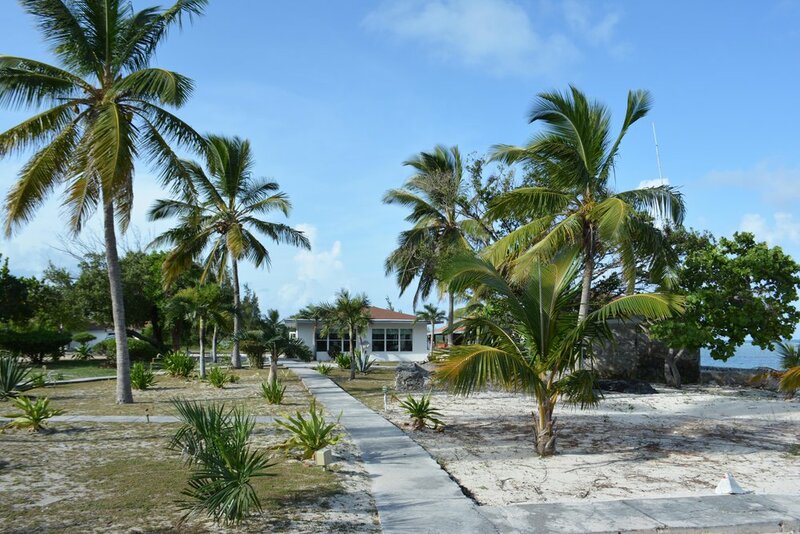 We headed north to a nice shallow and sheltered snorkel spot called Green Cay, where we all enjoyed grazing the sandy bottoms for treasures and in rock crevices for mantis shrimp and lobster. After cooling off, we decided to set up two block rigs with the aim of catching some sharks for our new and ongoing research efforts. Tristan lead an on-boat presentation on what we planned to do, and how, each person’s role, and equipment terminology and demonstrations, including an underwater ultrasound! Without delay we set and watched our lines some 200 feet away, which allowed us to act quickly when we caught a shark. Within five minutes, our paranoia kicked in as many of us thought we saw a float moving auspiciously, but no such luck. Twenty minutes later, however, we had a beautiful seven-foot (213cm) nurse shark on the line. We immediately hauled the other block, allowing us to give the nurse our full attention without worry of another shark being caught in the meantime. As it was Carlos’s birthday, he chose her name, Diana after his sister. We quickly worked the shark up, taking DNA and stable isotope samples, as well as measurements, before our guest Jenna placed the tag and the shark was released. Nurse sharks are very sturdy sharks and are an ideal species to showcase and explain a scientific work-up to our guests so we were grateful to Diana for her patience. All guests were given beautiful, bamboo covered Made by Fressko flasks to ensure no single use plastic bottles were used during the expedition. We set the blocks again and almost immediately caught a five-foot (166cm) reef shark. This little guy had the same full workup as the nurse but it was conducted far faster, as these sharks are typically more sensitive to capture, and our first priority is always the shark’s wellbeing. The data collected from these animals as well as the additional two reef sharks caught after is valuable information for science and conservation, and is of great interest to us, in addition to a number of our collaborators. Hot and sweaty in the Bahamian heat and with all the excitement, we couldn’t resist a final dip in the ocean before heading back to the lodge for some much needed grub! The lodge always provide wonderful, filling meals which our team appreciated and enjoyed every night, but tonight we were treated to a feast of locally (and sustainably) caught lobster, followed by a special birthday cake for Carlos that Annie had decorated with a hammerhead! With our tummies satisfied and a few beers/sodas to toast Carlos, we called it a night and headed to bed. 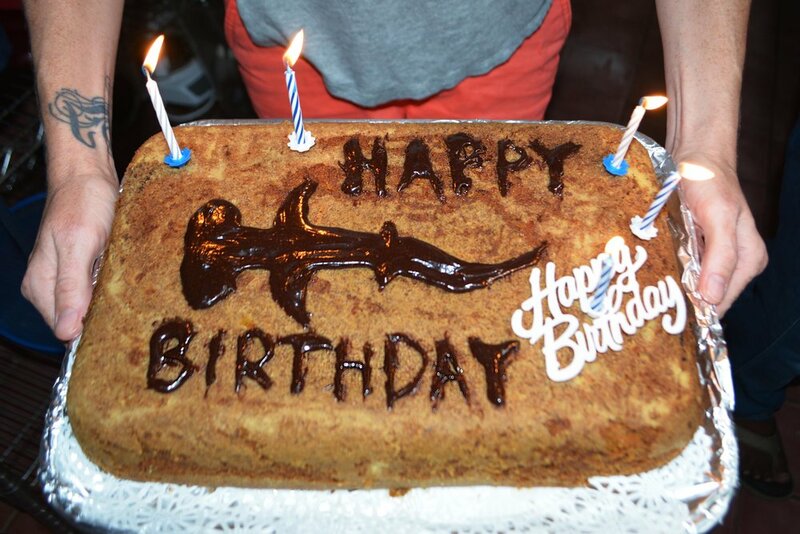 Guest Carlos celebrated his birthday with a shark cake, of course! The realization that we were over half way through our trip was hard to swallow, but with two and a half days left, we chose to stay positive. Today, we departed with the aim of a long baiting session with the greater chance of attracting a hammerhead or tiger shark. The water temperature seemed too warm but we were still all hopeful. We were two hours in and we had just a single blacknose darting around, we regrouped to vote, to persevere or to move on? The vote was in, we dug our heels in and kept baiting. Soon after we had three to four reef sharks and a large nurse, all adults with a maximum, approximate total length of six to seven feet (200cm). We all hung over the boat to capture a few topside shots before venturing in for a pretty special and intense dive! One particular shark was confident, very confident indeed, and appeared to be herding up the divers just for sport! Annie commented that the shark was ‘lairy’ which she later realized was an English term (it means cocky) that the guests didn’t understand. This term was of course lost on the crew, as they all thought Annie knew the shark and was stating his name, Larry… hilarious! Larry, as we of course later named him, was full of life and found himself zipping between our fins and swimming at the surface with what appeared to be no intent of turning away, all divers were engrossed in the moment and as Larry disappeared and reappeared from opposite locations adrenaline was pumping. Of course, this shark meant us no harm, however this was not a conditioned shark (not familiar diving with humans), there was bait in the water and so his behavior was completely justified. After a few hours of great diving we headed home where Annie and a few guests made their planned visit to a local school, Behring Point Primary School. Annie had previously worked with MABLE where together they organized over 70 toothbrush donations, one for every child attending the school. 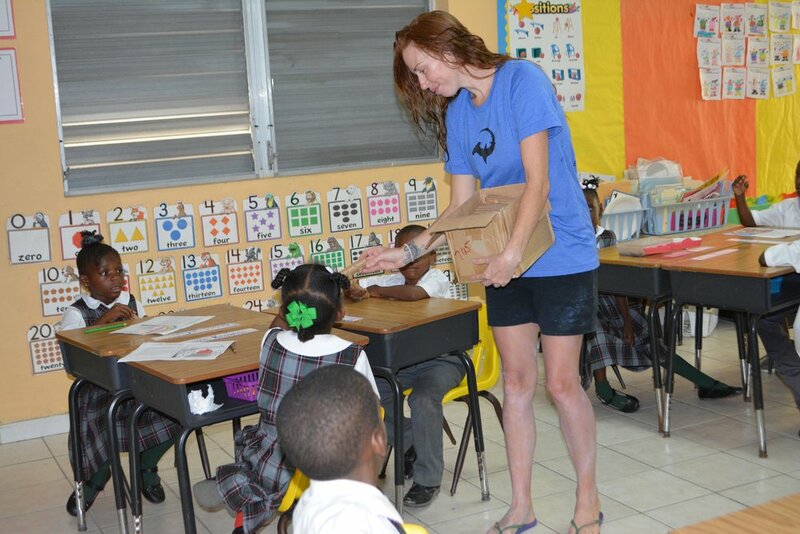 Annie was able to say a few words on sustainability and product choices to each class before she, and guests handed the brushes out to the eager children. This wonderful gift would not have been possible without the support of MABLE so we would like to thank them once again for their generosity. So, a quick ride home and with enough daylight still available we had one last ride out on the boat as we headed for an offshore blue hole. As we collected our thoughts, enjoyed the sunshine and fresh air, Annie yelped, “Dolphin!” A pod of approximately fifteen dolphins were playing and courting within a few feet of us. With visibility low we watched on from the surface as they twisted, turned and put on a show. A truly incredible moment followed, as they engulfed our boat. Within thirty minutes or so, we left them in peace to continue their antics! On arrival to the blue hole some guests enjoyed freediving down to depths of 60 feet (~20m), whilst others watched from the surface; eerie, dark, bottomless holes aren’t for everyone! A sight to witness nonetheless. With daylight diminishing we jetted home for a shower before enjoying some locally sourced coconuts with our At Mat Splat Mat stainless steel straws, a great way to finish off a fabulous day in paradise. After dinner, we all sat down to review our imagery and videos of the day, Larry was the star of course, and as usual we headed to bed before 9.30pm. The long days on the water were tiring, plus we all wanted to be on our A-game for adventure the following day. A 6am start saw us eating breakfast and leaving the dock by 7.30am sharp. Today we headed south to a known large shark location. On setting off we all knew the weather was far from ideal with 20 knots of wind and swirl, but we were game-on. That lasted an hour. With 8-10ft waves throwing our boat around like a rag doll, Captain Cole made the right decision to abort, and turn around. All week we had been fighting 15-25 knot winds, and finding hot spots in the leeward side of the island but we couldn’t make it to our planned location today, there simply wasn’t another route, so we went to Plan B. Can you spot Annie and the expedition guests? Our crew divided. Half ventured to Shark Hole for freediving with Tristan, and the other half headed with Annie for lemon sharks and sea stars. Shark hole is a rather spooky location, not because of the sharks but the visibility. Freedivers were operating strict diving protocols and within 45 minutes, the divers stopped their dives, and headed back to the boat to drone the beautiful and picturesque coastline from the air. The almost endless sandy beaches, turquoise water and abundant sea life make droning a real delight, and during one quick twenty minute stint, a lot was seen, including a blacknose shark and southern stingray. From the drone they found the other half of the group that had at least nine lemon sharks in just a few feet of water. The sharks ranged from two to six feet (60- 170cm), and they gained in confidence quickly coming closer and closer, making passes just a foot away from our cameras. One of the sharks was so confident he was swimming with his head out of the water, almost eye hopping, looking outside of its surroundings, so we named him Biter! After an utterly incredible few hours we all sat peacefully, deep in thought looking out to sea. These tranquil moments really put what we were doing in perspective; a group of passionate shark lovers, chasing their dreams in an idyllic location. 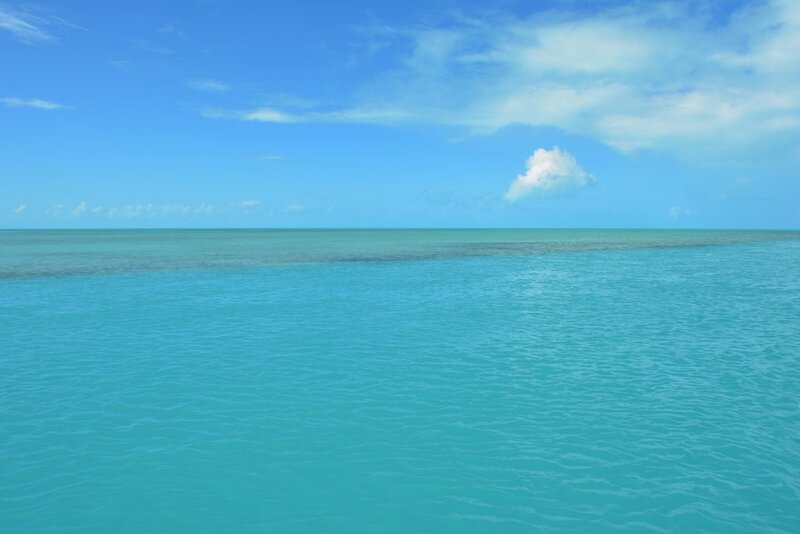 Quiet and peaceful in crystal clear waters with lemon sharks surrounding us we all sat quietly, with nothing but our own thoughts. We slowly gathered and walked back to the boat with huge smiles on our faces and memories that will likely stay with us forever. Back at the lodge we took a break for an hour whilst unpacking and repacking our belongings for a late night research gill net set. We regrouped and drove to a spot where we had previously seen sharks, but there were rumors of sawfish, and they were our focus. On arrival we waded out around a kilometer, in waist high water as we slowly but surely made it to the mangrove fringed location, where we set our net. Our teams split once again; half checked the net every 15 minutes hopeful for captures, whilst the others snorkeled the vast habitat and found themselves extremely deep in nomads land with upside-down jelly fish, and an abundance of juvenile life. Once the groups curiosity was satisfied they made their way back to the netting team, where unfortunately they’d had no captures. The net was however hit and broken with a slash type gash, unlike any shark damage we had seen before. Could it have been a sawfish? We will never know. The breakage gave us hope for future sets and with the sun setting we made our way back to land and headed home. Once at the lodge we all washed our equipment with fresh water, as we did every day, and were treated to some warm appetizers before sitting down to dinner at 7pm. We enjoyed our evening scrolling through our pictures from the day. For some of us, that took a lot longer than others, as Kelly, for example, managed to capture over 1,500 images within a ninety-minute window! After that, we were off to bed for our final night at the lodge. Up at 7am to absolutely stunning weather as we left the dock by 8am and headed to the off shore navy buoy once again. Within ten minutes of our arrival, we had a handful of silky sharks and even a mahi mahi. Another ten minutes past and we were all surrounded by six to seven sharks, ranging in length from four to seven feet (140-200cm). Silky sharks are known for their confident and bold persona, characterized by a fair amount of physical contact, and didn’t waste any time letting us know just that. The sharks surrounded us all and were ducking and diving between our legs bumping us with no real concerns. When diving with these sharks, it becomes obvious very quickly they are social animals that clearly make contact, and nudge each other regularly as they didn’t tone that down for our benefit! We are not advocates for touching sharks unnecessarily, but many of these pelagic silkies didn’t give us the same respect back! An adrenaline filled dive and perfect photographic opportunities with happy guests enjoying themselves in the big blue. With many sharks coming so close Tristan decided to trial our new capture technique on one of the silkies. The hand capture method involved placing the shark into tonic immobility whilst we collected the relevant data (DNA, stable Isotope, measurements) before tagging and releasing the shark. This method has many advantages such as a capture with no hook, however, its drawbacks include a lack of restriction and possible slight inaccuracy in measurements given the conditions and limitations in divers taking precise details. This trial was a real success and some exciting discussions and improvements will be in place for our January expedition! Please note that not all sharks can be caught in this way, and we STRONGLY advise you to NEVER attempt to do this for any reason! Furthermore, it is ILLEGAL in the Bahamas without a permit. After a successful work up, a success scream and high five our team finally, and reluctantly headed home one last time. On arrival to the dock we rushed to our rooms for a speedy packing session, grabbed a to-go lunch and then met with our local taxi drivers who took us to the airport. Our charted plane landed within ten minutes of our arrival and we were in the air within the hour. It seemed crazy only a few hours before this moment we were all in the open ocean diving with sharks and now we were flying home, it didn’t seem fair, it’s never enough! A few people fell asleep almost immediately on takeoff whilst others enjoyed the vast, pristine and utterly beautiful Andros habitats from the sky. Laughter and memories were shared, a few tears were shed and after our short flight we arrived back to Fort Lauderdale. Through customs we walked and our very (very) sad goodbyes awaited us as we headed home to reality… Our incredible expedition had come to an end, and although we will all miss you Andros, for some of us, this was just the start. Andros Oct 2018 crew, we’ll miss ya! We would like to take this opportunity to thank our wonderful guests for joining us, the incredible Andros Island Bonefish Club for their hospitality, the hardworking and ever professional Cole from PFO Charters for his top class boating and captaining skills, and everyone that help made this trip as awesome as it was: an entirely unforgettable October 2018. Keep in touch via our socials: Instagram, Facebook, and Twitter. If you would like to read our guest Jenna’s blog on her expedition experience, you can do so HERE. All of our 2019 trips are currently sold out, however please reach out if you are interested in joining us and we will add you to our waiting list.